Accurate submetering is the key to making sure the property owner gets reimbursed correctly and the tower owner remains in compliance with the lease. After examining nearly 50 different submeters on city building rooftops, we found roughly 75% were broken, damaged, incorrectly installed, or reading only a fraction of the actual usage. There is much to be said about the complexity rooftop managers, property owners, and metering companies face during every step of the process. From installation to invoicing, challenges can happen at any stage. These problems can stem from anything, like meters breaking by being exposed to the elements or simply due to human error. However, ECC has systematized a process that makes this complex situation very simple and always accurate. Below are our guideline practices that ensures accuracy for any rooftop submeter. In any contracting/leasing transaction this is a best practice but for whatever reason when it comes to complicated projects such as submetering, voluntary involvement is minimal. Know who is the main site engineer, maintenance technician, accountant, and project coordinator from both the tower owner, building owner, and metering company. These people will be vital to ensuring a smooth communication flow and easier understanding of site information. Confirm accurate readings while ON SITE and never leave an install without properly confirming the date and time the meter checked in correctly. Always mark where the meter, and it’s connected devices, were installed for faster return visits. Include any codes or keys for access to the various locations and units as well. Sending a technician up to a rooftop without the proper instructions can lead to hours of wasted time for everyone. *Fixing and installing meters should be completed as swiftly as possible. Putting off submeters that have broken causes the usage to go unread. During that time, the invoicing reads are left up to vague inaccurate estimations that doesn’t reimburse the owner accurately and therefor puts the tower out of compliance with their lease. Checking for any unusual variances, via smart meter graphs, is the best way to avoid having to estimate inaccurate meter reads for an invoice. By checking in on the meter reads only quarterly or annually, the power could be shut off in the building or a meter could malfunction and nobody would know until months later – leaving the invoice to a guessing game of estimated reads. Never rely on utility bills alone, or any other 3rd party, to track history and keep up with records. Make a file. Be a hoarder of history data. Designate a person, or team of people, as representatives from each party to receive/create invoices, construction/maintenance updates, and participate during regular communication. Constant check ins and requests for updates will slow the process down considerably. 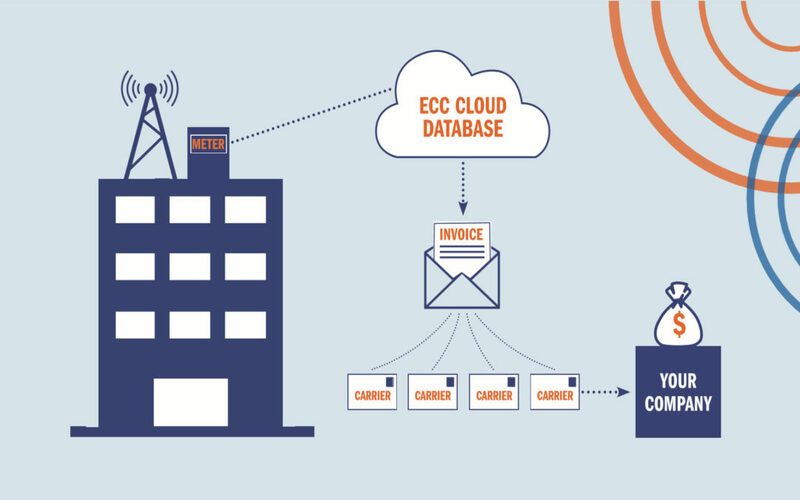 At ECC, we handle everything from installation to invoicing in house. We make sure the property owner receives accurate reimbursement for electric use and the carrier is in 100% compliance with their rooftop lease. Communication and experience are our key ingredients for accurate sub metering. If you are currently in a rooftop tower lease that is consistently inaccurate OR you are unsure of the current meter status at all, don’t wait or else the discrepancies and lack of histories will continue to grow.